With a mission of saving lives and protecting property, marine firefighters represent a unique emergency response sector that has responsibility for the protection of ports, maritime assets and shoreside properties, which are critical to national supply chains and international trade. Unfortunately, marine and near-shore fires can be extremely dangerous to responders and can cause very expensive, debilitating recoveries that can hamper an entire region’s ability to move cargo and continue business. Sea Machines recognizes these risks and urges marine firefighters to consider the benefits of adding autonomous-command, remote-control workboats to their fleets. The company’s SM300 and SM200 products can be installed aboard existing fleets and work hard on behalf of marine firefighting teams, in the following ways. Adding the Sea Machines SM300 to fireboats increases the speed and effectiveness of fire responses in several ways. First, autonomous, remote-control workboats do not require an on-board crew. An unmanned fireboat can operate within a one-kilometer range from a mothership or land position, allowing crews to respond from a safe location. Remote-controlled, unmanned boats help safely distanced firefighters gain new, advantageous vantage points that often can’t be accessed from land – a benefit key for fighting fires at shoreside oil and fuel storage facilities, airports, residential areas and other critical locations. 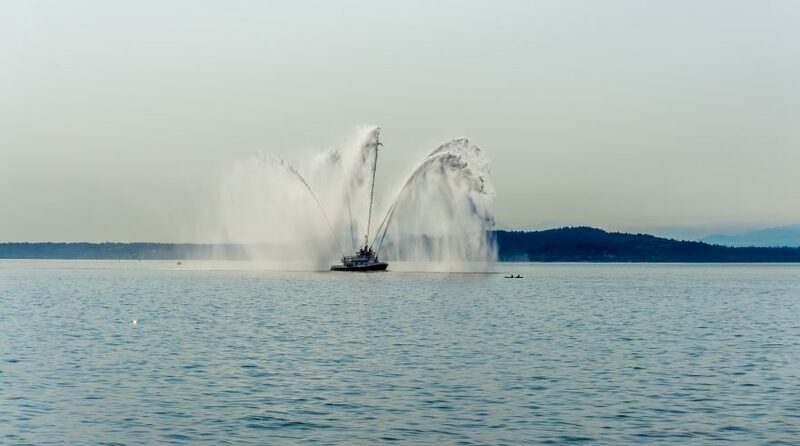 Unmanned fireboats are also unimpacted by roadway traffic, as fire trucks can be, and oftentimes can arrive faster to near-shore sites to begin pumping water or suppression materials earlier. Unmanned marine assets can perform more aggressive maneuvers and can inch closer to hotspots than trucks can, helping to suppress or extinguish a fire faster. When deployed with other assets, adding autonomous fireboats to fleets creates a force multiplier effect. While manned vessels are securing the fire perimeter or controlling secondary hazards, unmanned assets can access more volatile areas. For fire events located near shorelines, such as those occurring at ports and on jetties, unmanned marine assets can accelerate fire suppression by pumping water and foam into areas that are hard-to-reach from land. And because routes can be pre-programmed, an SM300-enabled fireboat can navigate a predictable path, such as tracking back and forth while spraying water or foam, offering a more reliable suppression strategy. Firefighting crews aboard motherships, where autonomous fireboats may be operated from, can also add unmanned aerial vehicles (UAVs) to their cache of tools to monitor fires from a bird’s eye (or drone’s) view, providing even more intelligence to crews. These combined efforts can reduce response times and increase effectiveness, compared to traditional methods. Fires don’t take breaks, so why should your incident response? SM300-enabled fireboats don’t require stop-work periods for crew shift changes or reduced nighttime operations. When operators’ boats are equipped with complimentary technology, such as FLIR thermal imaging systems, autonomous workboats can respond to fires 24/7, in nearly all sea states and conditions. With SM300-enabled fireboats, the safety of fire crews is improved because there is no longer any need to unnecessarily expose people to common firefighting hazards, such as heat, smoke, toxic fumes, risk of explosion and more. Adding unmanned assets to a fleet allows responders to focus on safer, more impactful tasks, while an autonomous vessel takes the heat. If you think unmanned fireboats are a thing of the future, think again. 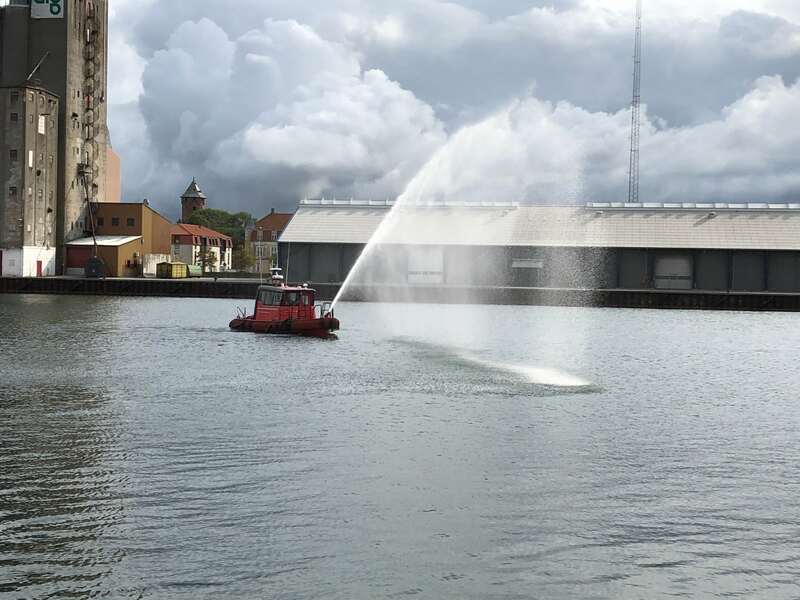 During the August 2018 Maritime Kulturdage event, in Korsør, Denmark, Sea Machines demonstrated the capabilities of its SM300 product aboard the world’s first autonomous-command, remote-controlled fireboat, a 12-meter ProZero workboat owned by TUCO Marine. In addition to autonomy, TUCO’s fireboat has also been fitted with remote-control fire-pump equipment, supplied by RK Brand & Teknik, that make operations even more efficient. 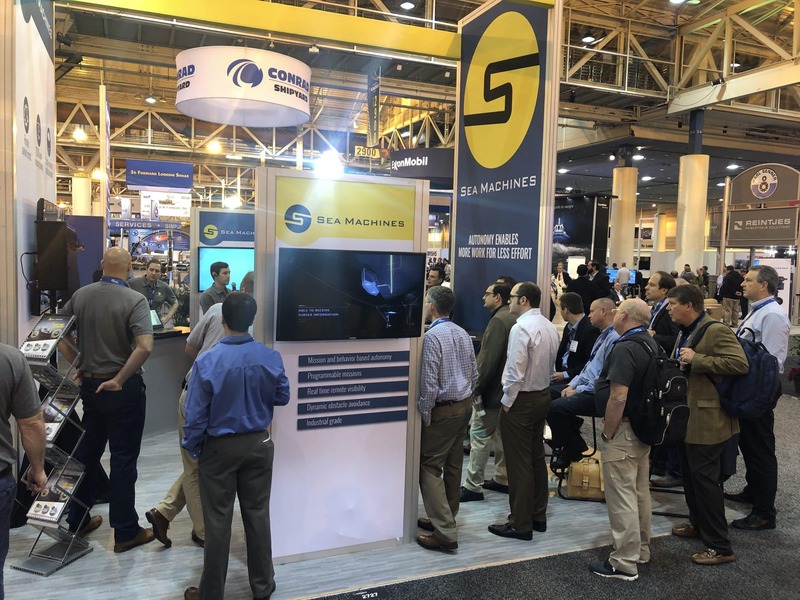 Then, in November 2018 during the 2018 International WorkBoat Show in New Orleans, Sea Machines proved the capability and reliability of its autonomous-command technology with a series of six live demonstrations that remote-commanded a workboat in Boston, more than 1,500 miles away. The workboat was also equipped with a fire monitor, which the New Orleans-based operator engaged over secure connection some 1,500 miles away. Installing such remote-command equipment in conjunction with Sea Machines’ technology allows operators to remotely control not only the boats, but also the on-board fire pumps, nozzles and more, for best-in-class firefighting. It’s clear that Sea Machines products increase the productivity, predictability, efficiency and safety of marine firefighting operations. The SM300 or SM200 can be added to fireboats as a retrofit or as part of new-build specifications, typically requiring only 10 components to install. Most vessels can be outfitted with a Sea Machines system in just a couple days. Even for small fleets, the system is surprisingly accessible, thanks to an affordable price point or flexible leasing options. As the U.S. Coast Guard and other firefighting response agencies adopt “drone boat” technology for incidents, it’s not a matter of if autonomous marine systems will become a vital part of marine fire responses, it’s a matter of when. Sea Machines is proud to be charting the path for autonomous systems for the marine industry. If you’re ready to modernize your marine firefighting operations, contact us today.